Today you may be thinking about overhauling your belief systems as well as your spiritual convictions. This can be as simple as picking up a book that challenges you to question you pre-existing notions, and it can be as profound as a spiritual awakening that strengthens your beliefs and your relationship with a higher power. The Hierophant is seen as the “Pope” in some decks. It refers to traditional values and belief systems, religiosity and faith in a supreme being. These are all commendable in moderation. But there are also negative aspects, such as narrow-mindedness, religious dogma and outright fanaticism. The Hierophant him- (or her-) self often refers to a spiritual leader or someone who makes (and enforces) rules about social behavior. In this version it’s definitely a “her” — a much kinder and gentler version than we’re used to seeing. She stands before what looks like an ancient temple, holding the world high above her in her hands. Her connection all things living is evident. The animals, flowers and fruits that surround her are all “worshiping” her and clamoring for her attention. There may be someone you look up to in much the same way. It could be a preacher or guru, a counselor, a writer or speaker or even a friend. The Hierophant can take on any of these forms: the main component is a message that inspires you and gets you thinking. Whatever role he or she plays in your life, you can know that there’s a reason for questioning your values. It’s all about letting go of what no longer serves you (spiritually or philosophically) in order to make room for what does. 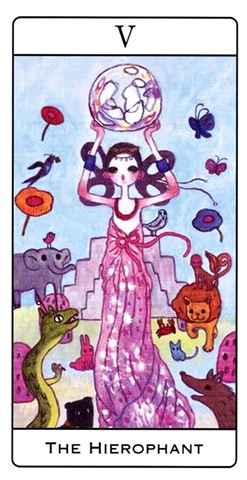 The card used for today’s tarotscope — the Hierophant — is from the Aya Takano Tarot, designed by Japanese artist Aya Takano.